Origami nativity in Japanese paper - Beautiful Golden Edition. Small and elegant Origami nativity - Ready to ship - FREE shipping costs! Quilled gnome nativity scene - unique and charming! Handmade. Miniature Handmade nativity scene in quilled hearts for valentine's day or for your collection! Complete Handmade quilling nativity scene in paper - 9 pieces and a hut! A beautiful collection piece :-) Two colors available! Unique handmade miniature quilling nativity scene with a paper hut and a star! All in paper! 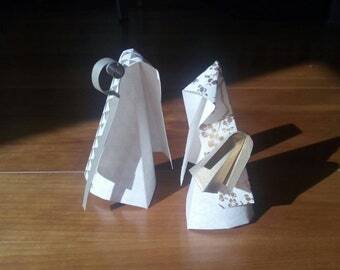 Japanese paper origami nativity - special edition! Origami Handmade Nativity scene canvas frame in banana leaf paper. Very original all in origami! Perfect for presents and collectors! This little origami Holy Family set is very cute and unique because of the pretty folded and patterned Japanese papers used. Beautiful handwork.. I am well pleased.